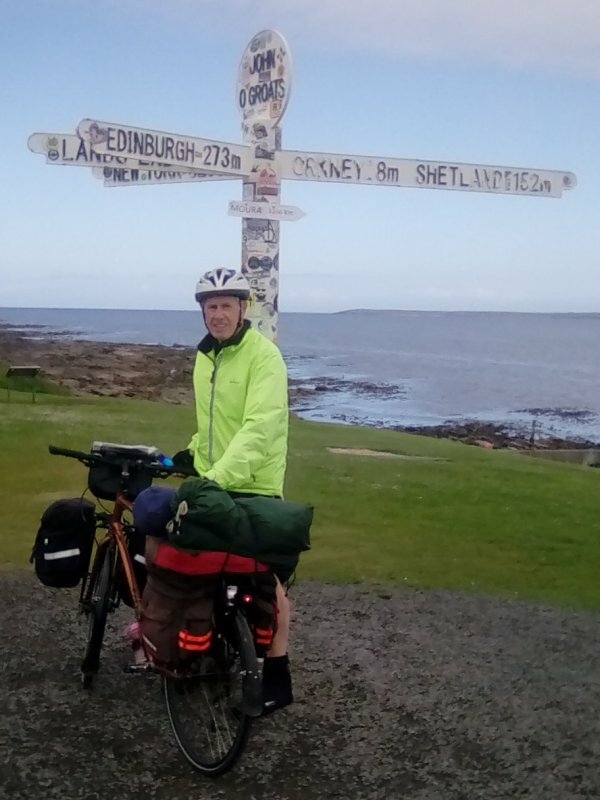 My bicycle ride from John O’Groats to Lands End was 3 years in the planning and with 5,500 training miles under my belt I set off on 19 June to achieve my goal, flying from Southampton to Wick I was reunited with my bike which I had sent up by road courier a week before. The first morning I awoke to rain, so packing up my tent I set off North to the the start point, which was the finger post at J O G then on to Thurso for my second night, which is where storm Hector was passing through, I was woken in the night to the tent violently shaking, thankfully it stayed up. The next morning I packed up and had to cycle 40 miles west in the face of strong head winds. Soon I was heading in a southerly direction with the weather slowly improving to what would turn out be gloriously sunny days for most of my journey, passing through the wild remote landscape of the Scottish highlands. One lunch time saw me passing the Crask Inn, according to my guide book the remotest pub in the country. Here I met other cyclists most going the other way so nearing the end of their rides. Lunch time on day 5 I was passing through Inverness where I met a German couple who were cycling from their home in Hamburg through France crossing over to Dover and up to the far north before taking a ferry to Norway and back home. That night I was between camp sites and had to wild camp. The best I could find was a wide verge beside the main A9. Surprisingly it turned out fine but the next morning the tent was covered in frost due I think to the altitude. The day after I passed over the Dalwhinnie summit then it was a very long downhill hill run for several miles and that’s where I met a much younger man who said he could go from top of Scotland to Lands End in 6 days – wow! Soon I was in Pitlochry and had a wonderful 2 days cycling through the beautiful countryside to Loch Lomond. This for me was the outstanding part of my ride. By lunch time the following day I was passing through Glasgow, the city centre down by the river is full of amazing futuristic buildings and it’s where I misread my route marker and ended up following the correct route number but in the wrong direction! After 10 miles the penny finally dropped and I had to retrace my steps, wasting 20 miles. The only saving grace was that I found a very good local sandwich shop and bought 2 very large baguettes which kept me going all day. That night I was again in between sites and came across the Strathclyde Country Park. I had no problem finding a quiet spot to put my tent up. I must point out that I always had at least 2 days food and water on the bike. Passing through Lockerbie one morning after an early start I went into the most prominent hotel in town and had a full English breakfast. The staff were so nice and afterwards when I asked if I could sit in lounge and check my emails they said have a lie down if I liked. Later this day I met a Norwegian cyclist who told me he had cycled throughout the UK and even through Alaska. While doing this he himself met an Englishman who had cycled the equivalent of 2.5 times round the world. Next on my route was the lake district with its many hills. In the course my travels and because it’s very heavy, I normally have to push the bike up the hills, this can be exhausting especially with the hot sun beating down. 5am, my plan was to be through the city centre and out into the southern suburbs before the morning traffic built up and I must say this worked very well. Now into the West Midlands I had the longest day yet, leaving Nantwich it was 12 hours on the road, hot and hilly covering just over 60 miles. The next day was easier with a short ride to Worcester where my wife Jennifer met me and we shared a welcome 3 night stay at a lovely spa hotel. Revitalized it was down to Cambridge just south of Gloucester for a night’s stay with my wife’s cousin, then down to Bristol to meet up with my son who rode the 50 miles with me to his home in Street. The next day I had the end in sight and keeping to the main roads i.e. A303 and A30, pushed on as fast as possible to my end goal of Land’s End. So after 1,240 miles and 25 days on the road I have completed my long held ambition to do this ride. I’ve had no injuries and no problems with my bike not even a puncture. I therefore feel very happy with my achievement.